Officials from the world-renowned Real Madrid soccer team’s Foundation are in Washington state this week visiting with Game On! partners in Seattle, Ellensburg, and Yakima. Through the three-year old partnership with the Real Madrid Foundation, Microsoft, and Central Washington University, Game On! currently enrolls approximately 250 underrepresented Yakima-area middle and high school students. As the only program in the U.S. of its kind, Game On! uses soccer as a tool for teaching soft skills, computer coding to teach STEM, and university involvement to provide direct access to higher education. 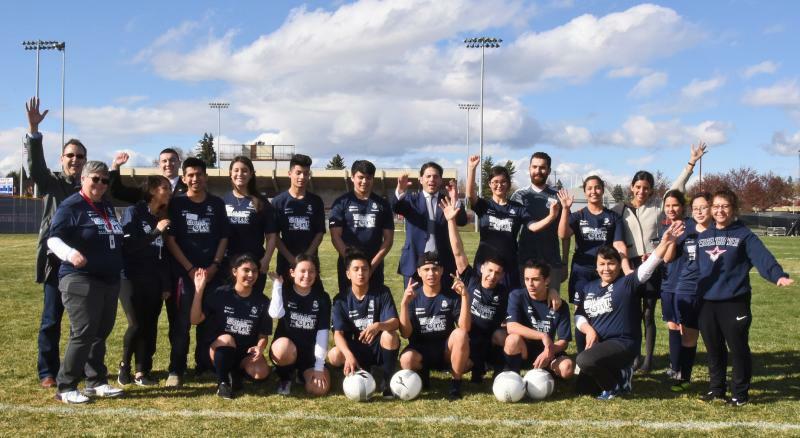 “We use sport and technology as a way to give them new tools, new opportunities to come to a university and continue their academic studies,” said Mateo Figueroa, Real Madrid Foundation America area manager. Figueroa and Anne Lise Bayo, Real Madrid Foundation project manager will be at Eisenhower High School, in Yakima, this week to meet with Game On! students, their parents and other school district staff to hear their thoughts on the program. “We want to see how they feel about the project and how we can improve ourselves, provide them with better services and better opportunties to make them better students, and at the end have them come to an institution such as Central Washington University,” Figueroa said. While at CWU, Figueroa and Bayo spent three days meeting with administrators and staff, touring campus, and evaluating the program. Talks are also underway with the Real Madrid Foundation, CWU, and Microsoft officals to develop ways to expand the program throughout central Washington and potentially the nation. Seven schools in the Yakima School District currently participate in Game On! This spring, Mabton School District and Henry Beauchamp Community Center in Yakima are slated to join, bringing the total to nine programs. The partnership believes this is just the beginning. Game On! targets students whose parents have limited exposure to higher education, and shows them in fun and unintimidating ways that they are are academically capable and attending college is a possibility. “It’s not a matter of the pipeline to Central, although I have to tell you as the person who oversees enrollment at Central I would love to see these students come here, but it’s about our ability to make college a real possibility for these students,” said Sharon O’Hare, CWU vice president for stragetic enrollment management. For more information about Game On! or to donate support to the program contact Manuel Rodgriguez, CWU Game On! executive director at 509-963-2216, Manuel.Rodriguez@cwu.edu. Top photo: Manuel Rodriguez, CWU Game On! executive director stands next to Mateo Figueroa, Real Madrid Foundation America area manager as they talk with Game On! participants. Bottom photo: (l-r) Game On! partners pose with students and staff.